This is a very common issue for most candidates at the outset of their McKinsey PEI preparation. According to experience, there are 2 factors why most candidates have difficulties to finding the right examples (hint: it’s mostly not because they lack suitable examples at all – it’s more about how you start thinking about your examples). 1) Focusing too much on how interesting/exciting/exceptional the McKinsey PEI example (or to be more accurate: the general context of their PEI example) is. However, the context from which you take your PEI example is much less of a concern and hardly influences your PEI evaluation. It’s much, much more about your personal contribution to that specific situation (bonus: does that ring a bell with the “Anticipated consequence” of the PARADE framework?). So how did you (positively) influence this situation? What was your real-life value in that situation? 2) Starting to think about potential PEI examples just with the broad categories Leadership, Personal Impact and Entrepreneurial Drive in mind. Instead of that, you need to precisely understand the key topics that McKinsey is interested in each of those PEI dimensions, and thus which aspects your PEI examples need to cover. In other words, finding the right examples is mostly having a crystal-clear understanding of the McKinsey requirements, and from there doing some backwards-engineering to find which of your experiences covers those aspects best. 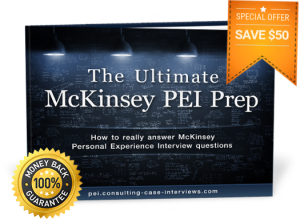 You can find much more information about how to find the right McKinsey PEI examples in The Ultimate McKinsey PEI Prep eBook! Next Next post: Can my McKinsey PEI examples come from experiences some years ago, related to work?